Some revolutions end in triumph, others in tyranny. It's a walk on the edge of a blade between glory and the guillotine. And BlackBerry has had its share of revolutions - the most recent ones being the rebranding and the OS gone touch-only two iterations ago. The Z10, powered by the gesture-heavy BB10 OS, was... is... a revolution of sorts, too. Next thing you know, it's business as usual over at BlackBerry. They're back to what they do best. The revolution is over and the message is out. There couldn't have been a better messenger either. Not a QWERTY messenger that we can think of, anyway. Oh well, the BlackBerry Q10 sees the Canadians back to business but the business isn't what it used to be. That said, the time-tested form factor isn't a simple copy-paste job. In fact, getting rid of the trackpad and call keys is nothing short of a revolutionary change. The swipe-driven BB10 OS provides plenty of new, exciting ways of interacting with the device, while keyboard shortcuts and Instant Actions will add extra speed and flexibility but, considering the Q10 is a phone for loyal BlackBerry users, old habits will have to be broken. 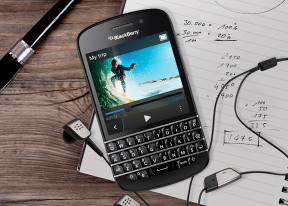 Here's what they'll be getting in return with the BlackBerry Q10. The BlackBerry Q10 isn't as powerful as the full-touch BlackBerry Z10, and it doesn't need to be. The Q10 features an energy-efficient 3.1" Super AMOLED display at 720 x 720 pixels, which won't put a massive strain on the GPU either. AMOLED technology debuts on a BlackBerry phone, with its top-notch contrast and outdoor legibility. At 720 x 720 pixels, it boasts the seriously good 328ppi - not as impressive as Full-HD screens but well into Retina territory. The BlackBerry 10 OS is a brand new platform and even though the 10.1 update brought some welcome additions, it is still an infant OS that needs polishing. BlackBerry is already working on the 10.2 update, with more major revisions to follow. Maps will only get better we hope and the app repository will surely expand with more content. The future-proofing of the Q10 should be less of an issue for BlackBerry though - they may be losing market share but there must still be enough users who will see the Q10 as the ultimate upgrade. It's the future of the entire messenger concept that's more in question. Let's see what the BlackBerry Q10 can do about that. Hi! I just wanna ask if we can still do software upgrade for this BBQ10?